Next time you are taking in the beauty of the Niagara Falls from the Parkway, take a look around you at some other pieces of Niagara Falls History. More than the magnificent falls, here are 5 famous structures to check out while you are there. 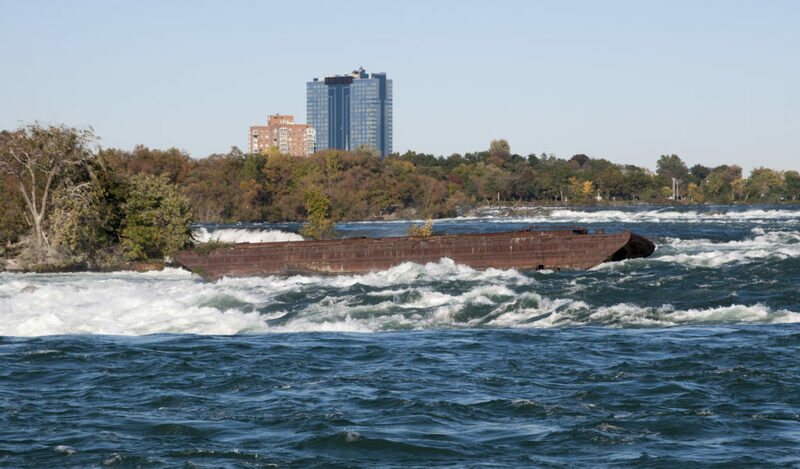 On August 6, 1918, Gustave Lofberg and Frank Harris were aboard the sand scow dredging up sand banks from the Niagara River upstream of the waterfall. The scow was being towed by the tug boat “Hassayampa”, which was operated by Captain John Wallace. When Captain John Wallace brought the “Hassayampa” over to bring the scow back to shore, it broke loose and began floating downriver rapidly towards the Horseshoe Falls! With Lofberg and Harris aboard, the boat got caught on a rock shoal half a mile from the edge of the falls after the scow swung sideways in the turbulent water. It grounded and became lodged on a rock shoal not too far from the brink of the Horseshoe Falls. The Niagara Falls (Ontario) Fire Department tried used a grappling gun to shoot a life line out towards the barge while waiting for the US Coast Guard to arrive. The US Coast Guard was able to send a lifeline over to the barge, and the breeches buoy ended up getting tangled. William Red Hill Sr. volunteered to try to reach the men. Using the rope, Red Hill Sr. set out at 3 a.m. with spotlights to try to save the two men. He struggled and was unable to untangle the ropes. He set out again by daylight at 8 a.m., and was successful this time. By 9:30 a.m. the two men were being safely returned to the shore. The whole ordeal lasted 17 hours. Currently, you will still see the Niagara Scow in place. There is a plaque across from it explaining the history of the wreck. Ceasing operation in 1974, the Toronto Power Generating Station was built in 1906 and was one of the first Canadian-owned hydro-electric facilities. You can find this beautiful building alongside the Niagara River, just above the Niagara Falls. The station was built by the Electrical Development Company of Ontario under supervision of Hugh L. Cooper to supply hydro-electric power to nearby Toronto. The water from the turbines ran out through a brick lined water wheel, which eventually came out at the base of the falls. The tunnel dimensions were 10 metres in diameter and 610 metres long. It was the largest of its kind in the world during that time period. The station operated 11 turbines which produced 11,000 horsepower each. Total power output was equal to 131,420 horsepower. Upgrades after being purchased by Ontario Hydro in 1922 improved the horsepower of each generator to 12,500 with a total output of 137,000 horsepower. 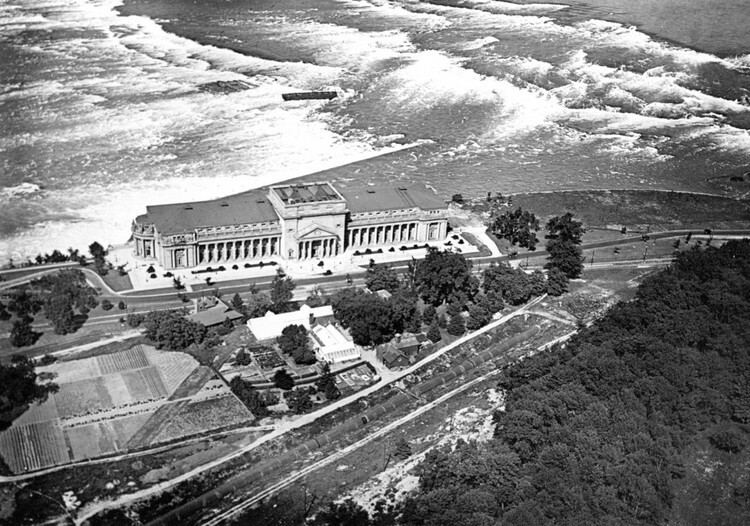 Eventually, Ontario Hydro looked to make better use downriver at the Sir Adam Beck Hydroelectric Power Stations in Queenston, Ontario, and in 1983 the vacant Toronto Power Generating Station was designated a National Historic Site of Canada in 1983 due to its importance in the development of business, industry and technology in Ontario. Born in Croatia in 1856, Nikola Tesla was regarded as one of the most influential inventors of all times. He was a pioneer in the discovery of radar technology, X-ray technology, remote control and in 1895, Tesla designed what was among the first AC hydroelectric power plants in the United States, at Niagara Falls. The Tesla monument has been erected on both sides of the Niagara Falls. 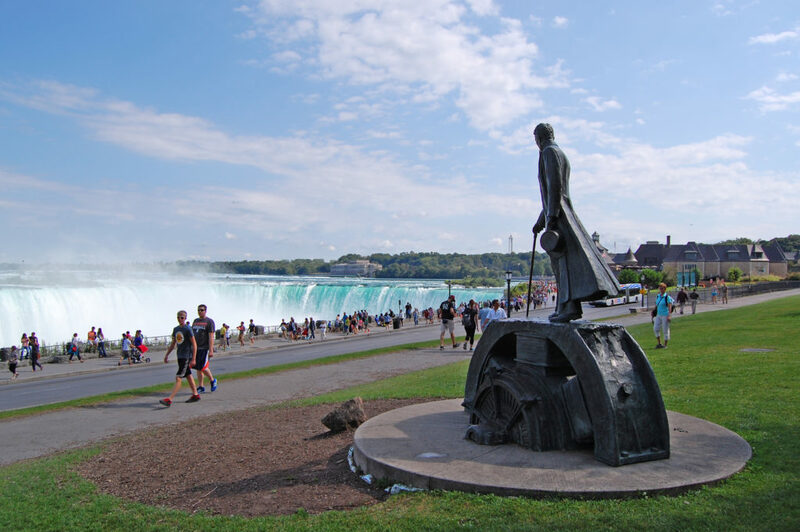 The sculpture that was inaugurated in the New York was presented by Yugoslavia in 1976, and on the Canadian side of Niagara Falls, the Tesla monument can be found in Queen Victoria Park. The sculpture was unveiled in 2006 on the 150th birthday of Tesla. 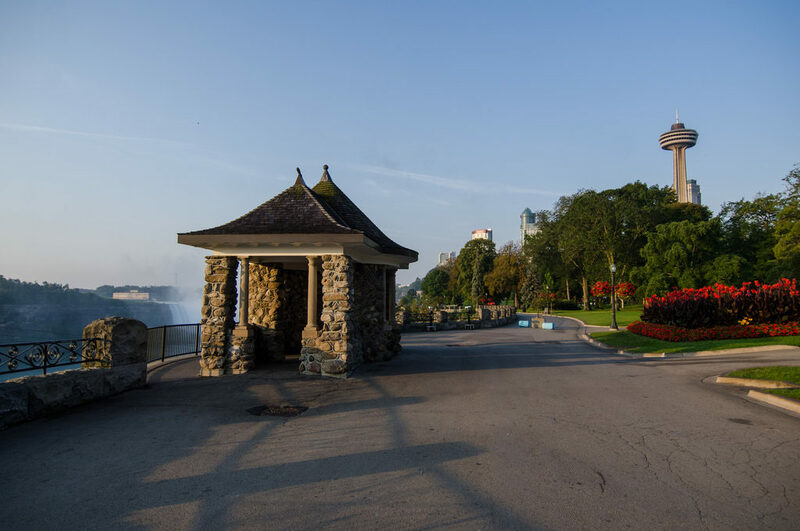 Built in 1907, this is a stone heritage pavilion that overlooks the Niagara River, between the Canadian Horseshoe Falls and the American Bridal Veil Falls. It was built as resting place for pedestrians, with protection in case of any storms. Clifton Hill’s location essentially started out because of a man named Samuel Zimmerman. Samuel Zimmerman was an American who came to Niagara in 1842 and was a very gifted contractor, and quite possibly one of the best of his time. He made a fortune on projects such as the Second Welland Canal, and was the man behind the building of the Great Western Railroad from Hamilton to Niagara Falls. He was also a primary supporter of the first railway suspension bridge to be built across the Niagara River Gorge. The “Village of Clifton” was initially a piece of property owned by a man named Captain Ogden Creighton, and the village started laying out buildings and streets in approximately 1832. It was Creighton who gave this future settlement the name “Clifton”, derived from the town of the same name in England. Upon his death in 1837, his wife sold the property to Samuel Zimmerman. He later had the Erie and Niagara Railway routed through this town. In 1848, Zimmerman purchased land in the “Village of Elgin” (which he named after Lord Elgin, the Governor General of Canada) after the first suspension bridge was built and houses started to span out with its first settlers in the area. This was the area of Niagara Falls that contained Queen Street, Park Street, Huron Street and Morrison Street. In 1856, the boundaries of the Village of Elgin were expanded to include the area of the Table Rock. In view of this expansion and its subsequent increase in population, the Village of Elgin now had enough citizens to become a town rather than a village. Because the name Elgin had been previously used, the name of the newly formed town was changed to the Town of Clifton in 1856 (it amalgamated with the Village of Clifton). In October of 1881, at the request of its residents, the former Town of Clifton received permission from government to change it’s name to the Town of Niagara Falls. 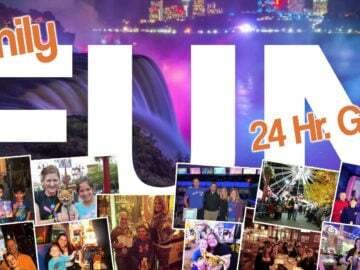 By 1881, the population of the Town of Niagara Falls was 2,623 citizens — a far cry from its population today at approximately 83,000 inhabitants. Zimmerman created an estate property along the south side of Ferry Hill (now Clifton Hill) that he called “Clifton Place”. On his estate, Zimmerman undertook to create many gardens and several large fountains. He planned to build a mansion that he hoped to live in once it was completed. 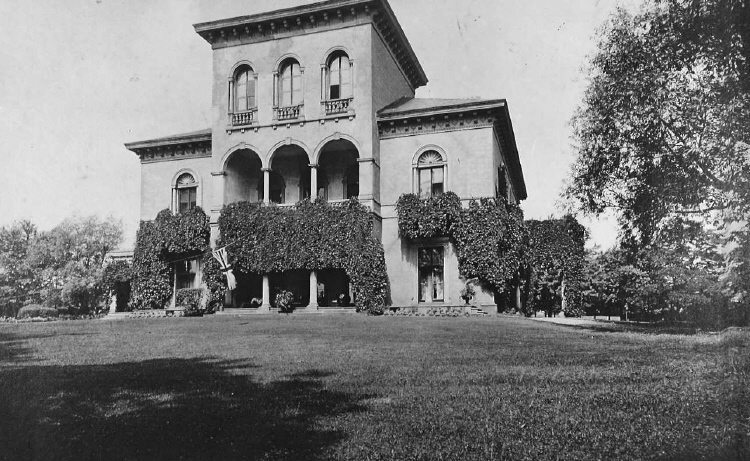 His estate was bounded by Clifton Hill, the Niagara River, Robinson Street and Ferry Road (now known as Victoria Avenue). Today this property is owned by HOCO (Sir Harry Oakes Company). Unfortunately, Samuel Zimmerman saw only the foundations of his mansion built before he was killed on March 12th 1857 in the Desjardins Canal Railway accident. The train derailed and plunged into the canal killing 59 persons including Samuel Zimmerman. Upon Zimmerman’s death in 1857, his estate was then taken over by U.S. Senator John T. Bush (the estate included the ownership of the first Clifton Hotel). 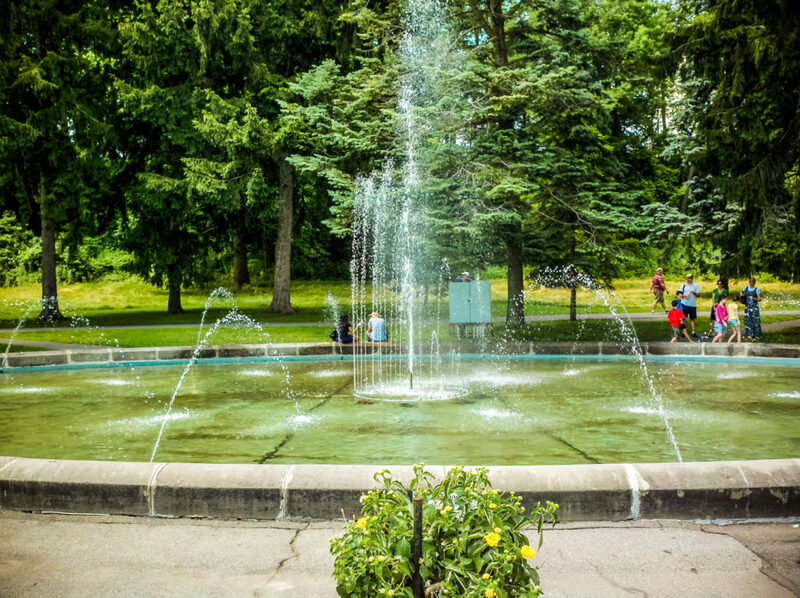 It was Bush that completed the restoration of the mansion, and even though the Zimmerman/Bush mansion no longer stands, the “Zimmerman Fountain”, a large stone fountain built by Samuel Zimmerman below the moraine (now Queen Victoria Park), remains today.